I suspect the garlicky spirit would make a great base for other savory cocktails, like Bloody Marys and Salty Dogs, but here you’ll enjoy it in its purest state. Place two cups of loosely packed, washed garlic mustard leaves in a blender and add a 750 ml. bottle of either gin or vodka. Pulverize the mixture on high until the leaves make a slurry. Pour the mixture into a closed container and refrigerate for 24 hours. Strain the infused liquid through a coffee filter and throw away the solids. Refrigerate the liquid again for 24 hours. You’ll probably notice a small layer of fine sediment on the bottom of the container. Filter this one more time to produce a clear, infused spirit, then move the liquid to the freezer. Finding the perfect balance for a Gibson or a martini is a personal thing. Whether you like yours perfectly dry or vaguely moist, I won’t criticize. The proportions below are perfect for me, and I encourage you to find your own personal best. 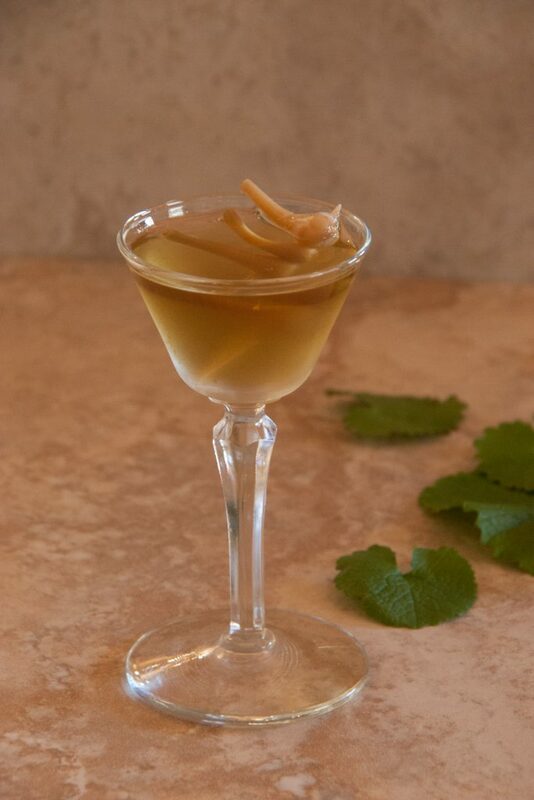 In a cocktail shaker full of ice, combine 3 ounces of ice cold, garlic mustard infused vodka or gin with a capful of dry vermouth. Stir (sorry 007) for 30 seconds, then strain into a martini glass or coupe. Garnish with three pickled field garlic bulbs. Here’s to the wildcrafted cocktail. Cheers!